His Highness Shakih Hamad Bin Isa Al Khalifa has assumed the title of the Kingdom of Bahrain on 16th December 1999 After the late Amir of his father his highness Shaikh Isa Bin Salman Al Khalifa. The head of an Oryx. Thomas de la Rue and Company. The Ahmad al Fateh Islamic Centre – The Centre was built between 1983 and 1988 to commemorate the two hundredth anniversary of the rule of Bahrain by the al Khalifah dynasty. It is the largest building in Bahrain and the mosque can hold 7,000 people. A two-masted dhow under full sail – Strangely, the word ‘Dhow’ is foreign to the Arabian Gulf and its origins are unknown. However, the word is now commonly used to refer to any sailing vessel. Boat-building in Bahrain has a long history, and there are many types of traditional sailing vessels that have been built on the islands. In former days the planks of the vessels were sewn together, but in later times were nailed. In modern times the types of boats which have been constructed are those which lend themselves to the addition of an engine. An aerial view of the customs and immigration island – This island is situated halfway between Bahrain and Saudi Arabia on the King Fahd Causeway that links the two countries. The causeway is 25 kilometres long, took four and a half years to build (after a long period of planning) and was officially opened on 26 November 1986. The island contains both Saudi and Bahraini immigration and customs offices. The south-western tower of Riffa Fort – The fort of Riffa is built on the escarpment overlooking the Hunainiya valley south of Manama near the centre of Bahrain. Work commenced on the fort in 1812 under the authority of Sheikh Sulman bin Ahmed al Khalifah. It is thought that the fort was built on the site of the palace of Sheikh Farir. Sheikh Khalifa Bin Salman Al-Khalifa. 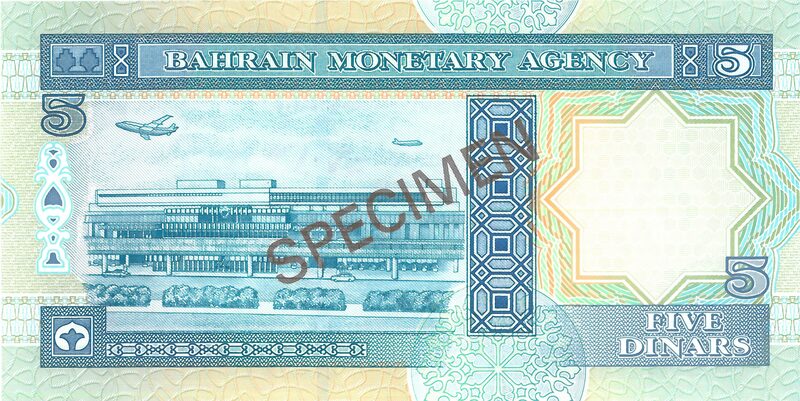 Wide, windowed thread with “BMA” (Latin text) and “Bahrain Monetary Agency” (Arabic text) microprinted on the thread. The original international terminal was opened in December 1961, but a new terminal built to handle the increased traffic opened in 1971. Further expansion took place in 1975 and in March 1994 a major refurbishment and expansion of the airport was completed. A Dilmun seal – The history of Delmon civilization goes back to about 3200 BC. 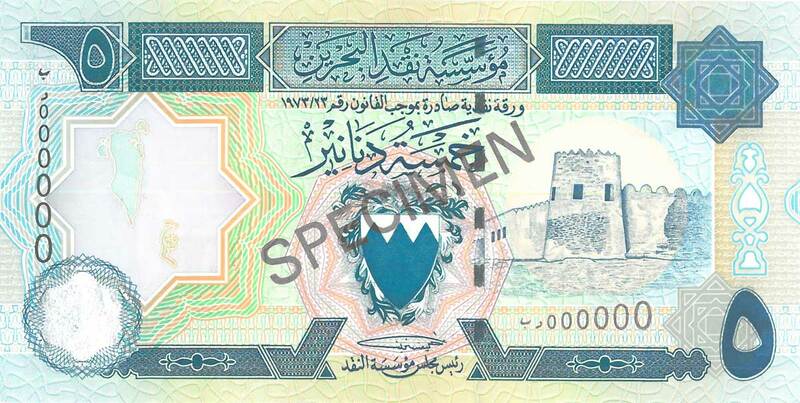 It lasted for more than 2,700 years between Bahrain and Failakah Islands towards the north of the Gulf. Shaikh Khalifa bin Salman Al Khalifa. 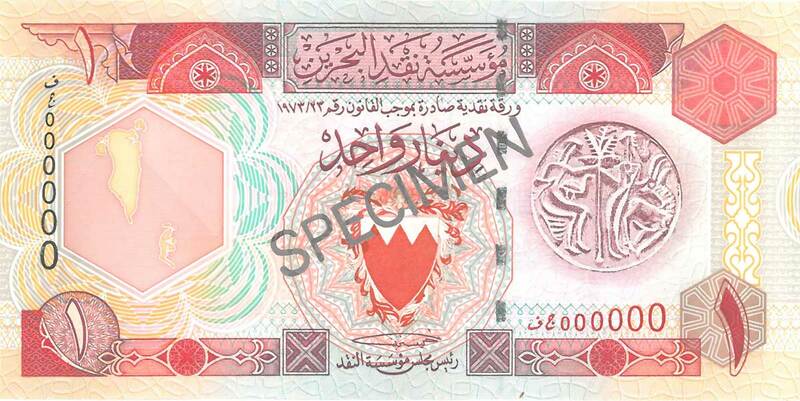 The headquarters of the Central Bank of Bahrain (CBB). 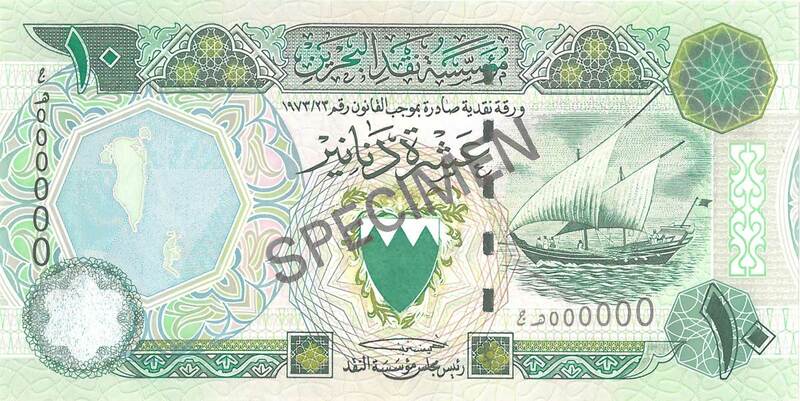 The Bahrain Monetary Agency was established in 1973 and was succeeded by the CBB in September 2006. The CBB has all the powers and responsibilities normally associated with a central bank.